Grace and peace to you from God our Creator and our Lord Jesus who is the Christ! Will y’all pray with me? May the words of my mouth and the meditations of all our hearts be acceptable in your sight O Lord, our rock and our redeemer; amen! So, if you’ve been paying attention these past few weeks to the gospel readings, you’ve probably noticed that they have a lot to do about ‘the future!’ Particularly our response to the signs that can be seen. These sorts of texts always come around at this ending/beginning time in the church year. We hear watch out, be prepared, keep awake, as we end the church year – seeing signs of judgment and God’s presence around us. As we begin the church year, we again hear watch out, be prepared, stay awake. Yet, I noticed that this reading in particular has a somewhat different shift in its tone. Before when we heard ‘watch out’ it was coupled with something negative or terrible. And, when we think about those words today – we always seem to have them associated with danger as well. WATCH OUT! Objects in mirror are closer than they appear! CAUTION! This item gets extremely hot as it holds hot liquids! BE PREPARED! Just because your child says they feel fine does not mean that their recently digested food isn’t going to pay you a return visit soon! Even today in our world, whenever we hear words of caution from those we love, they never seem to be followed by good stuff. With the news of the day regarding inappropriate touching and actions the unspoken and quiet ‘be prepared’ talks of before have come to light and are shared out in the open – which is good mind you. In fact, I’d venture to guess we rarely if ever hear those types of warnings. Yet, this morning we hear a shift from Jesus’ words about ‘the watchfulness and preparedness’ for those around him. Jesus tells them a short little quip about a fig tree. Just as you see the fig tree branches get loose and grow leaves and know that summer is coming, so too take notice of the sights and sounds you see around you now! I don’t know about you, but that doesn’t particularly invoke in me a sign and sense of dread. I happen to like figs – in fact I have a fig tree (or a few) right at the side of my house. As summer approaches, I enjoy walking by that side as I’m working in the yard or playing with the kids and taking notice of the leaves as they green and the fruit that slowly begins to grow. It’s pretty neat. I also know that soon will come a time that I can pick that fruit and eat it for myself and share it with those I love! When I see those branches become tender and the leaves putting forth – good things – are about to come. Leading up to this Sunday, all our ‘watchfulness’ was clouded in dread, destruction, and fear of what could come. Yet, this morning, we hear from Jesus a slight shift in how we are to look and be ever watchful – to keep awake. As we ‘keep awake’ we remain in hope of what is to come. During this season of advent, we wait. We wait for the celebration of the good thing that God has already done in the world – creation, coming to literally ‘sit-with’ us, and redeeming the world through the victory on the cross over sin and death. During Advent we wait in celebration of that. But, we also wait in expectant hope for God’s continued work in the world and our Lord’s return to bring us into completeness and wholeness in God. We wait in expectant hope with one another and we wait in hope at work in the world. Continuing to see the signs, to point towards God’s work in the world, seeing the Spirit’s action and prodding among us, and being moved through that action and our prayers to bring God’s continued and life-giving justice to the world. And, like I’ve said before – it isn’t easy doing any of the stuff. Especially during this time of year. 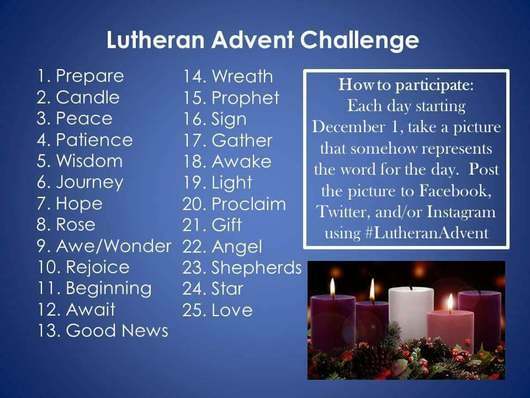 It is odd that Advent is probably the MOST counter cultural season of the church year. Everyone has been rushing to get to Christmas since probably before Halloween, yet we enter into this season with the intention of waiting. Holding off the urge to jump to the celebration – especially because the world has seemed so dark and cloudy within our cultural climate. We wait – we wait in expectant hope – but, we wait. So, I have an idea. I have this ‘challenge’ I’d like to pass out to y’all. Seeing God at work in our lives isn’t always the easiest endeavor to take. Mostly because we are bad at being intentional about it – not because God isn’t at work. So, here’s a ‘photo-of-the-day’ challenge for each of you. Each day (and you notice two have already come and gone – and that’s OK too), there is a word. Find something that day that reflects that word. Take a picture of it. Post it to our Facebook page, print them out and bring them here, leave them on your phone or your camera as a reminder of God’s presence. If you don’t want to take a picture – tell a story of something that happened to you – something that you’ve witnessed that day which reflects that word. Have fun with it y’all. We wait – we wait in expectant hope. It isn’t easy to wait – we don’t like it. But, it doesn’t mean we wait alone nor does it mean while we wait, we do nothing. We wait and ‘sit-with’ together. Sharing our stories, our thoughts, our prayers. We work in service and faith together to show and live into God’s love and mercy in the world. which creak on shrill and angry hinges. About your own soul of all and its condition. The peace of ground from which you see the world. What do you see as we sit this Sunday at the gates of hope as we begin this season of Advent? Waiting in expectation of what God has done, is doing, and will do in the life of the world. We wait. We hope. We keep awake for what God is doing. Amen. Is it really December already? Wow. It has been one crazy year. And that’s putting it mildly. Each year we go through this cycle of ending and beginning – a cycle of renewal. Each year we hear those hard words from Jesus about ‘waiting, being prepared, and to be watchful.’ Each year those words hit in ways that we wouldn’t expect. And when those hard sayings and teachings from our God are over – it doesn’t necessarily get better when Advent rolls around. For, we are still waiting. We are still watching. We are still being asked to be prepared. Yet, there is a different tune to the question now as it is asked of us as we enter this holy time. The season of Advent is a two-fold time of waiting. Advent means arrival. We wait for God’s arrival in celebration. During this time of the year – as we enter into a new church year, we do so remembering how God entered into the world to be with us. In a way that is unexpected, unassuming, and dare-I-say scandalous. God comes to us in the form of a baby born to parents out of wedlock into a tiny backwater part of the world. It is in that moment of incarnation (becoming flesh/person) where we know that God has come to ‘sit-with’ us. Much like a dear friend or family member comes to ‘sit-with’ us during difficult times – to bring comfort, to be present with, to remind us that we are not going through this alone. But, just as we wait in celebration for what God has done, we continue to wait with expectant hope of what God has promised as well – we wait for God’s promised return. This is the waiting that we don’t ‘sit-with’ well. The sort of waiting where we look towards the comfort, wholeness, and peace that has been promised. It is hard to wait for that sort of hope and promise as we continue to hear news stories about shootings, violence, and tweets. But, we don’t do this sort of waiting alone or in stillness. We wait together as the Body of Christ and we work together as that Body to serve those in need, to learn and grow with and from one another, and to have fun. We do all that so that we might continue to see glimpses of God’s presence in our lives. We get to wait in service and love as we join in with wonderful ministry opportunities like the Angel Tree Ministry (helping to create a more complete and fuller Christmas for foster children in our community) and raising money through the ELCA’s Good Gifts campaign (where we can help individuals and families in need throughout the world). Those are just two of the many opportunities within our community to wait in service during this season of Advent. As Advent begins (on December 3rd), we also get to ‘sit with’ a larger Body of Christ at Redeemer – we get to welcome five new members into our community: Mary Maercklein, Andy Sidden & Kevin Dove, and Robbie & MaryAlex Kopp. They are all pretty amazing folks to ‘sit with’ in this time of waiting in expectant hope. Each of them has amazing gifts that they bring to ministry not only here at Redeemer, but in the life of the community of Newberry as well. Advent is a time where we ‘sit-with’ one another. Bring comfort to our lives, providing presence, and remembering that we do this all in community with one another. We also remember that God is there ‘sitting-with’ us as well. ‘Sit-with’ one another and remember that God ‘sits-with’ each of us. So, this is an interesting text to hear from Matthew as we end this Church year. At the end of this cycle of texts (the ones we’ve been hearing these last few weeks) it can be kind of scary. We’ve heard about waiting, not knowing, being ready, fear, weeping and gnashing of teeth, being thrown into the outer darkness. 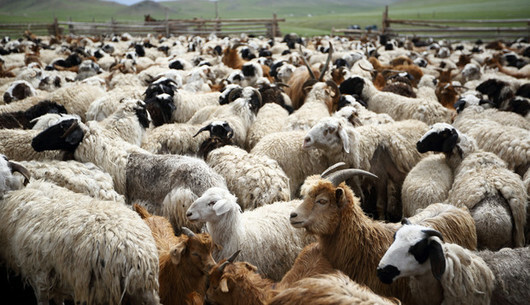 It doesn’t help that in the gospel reading that we hear this morning; Jesus is separating the sheep from the goats – one to be given over to eternal life the other eternal punishment. Am I sure I’m with the ‘good?’ Am I one of the ones that needs to be a little worried? Am I doing what I’m supposed to be doing in God’s eyes? It’s those sorts of questions that we ask when things are ‘coming to an end.’ For today, this is an ending, today we celebrate Christ the King Sunday – the last Sunday in the church year. We hear this reading about the one who sits on the throne and judges the nations. We hear this vision from Jesus about helping those in need, for in helping those in need Christ is being literally attended to and served. We hear about those who didn’t do those things, for they didn’t know they were in the messiah’s midst. For us as followers of Christ who identify as Lutherans, this can be a text that makes us uneasy. Is Jesus here talking about how our works are what saves us. That we must do these good things in order to garner favor with the shepherd who sits on the throne and is doing all this separating? In all of this, we hear and have heard very harsh words from Jesus in what he foretells what the kingdom of heaven will be like. In the end Jesus calls for his disciples and those to live into the faith that he has modeled for them and for us throughout his ministry. We have to remember that Jesus says these words and tells these stories towards the end of his life and before the cross. He’s trying to get it across to those who follow him how serious he is about how they are to live in the world – the new world in which he is bringing and (for us) has brought into the life. As he tells of the one who sits on the throne who separates, I think there is something that we at times misconstrue. We place upon our Lord the same reasonings and thoughts that any of us would be like. If Jesus is going to sit on that throne – if we are going to call and claim him as king – we think he’s going to act like the kings and rulers we know. Yet, we are reminded again and again that Jesus is unlike any person we’ve ever encountered before. Jesus has asked his disciples and us to see him in the faces and lives of those who are sick, hungry, tired, and imprisoned. It is in them that we see Christ and we are called to be with those and provide for them in their need. And sometimes that is difficult. We can acknowledge that. We’ve talked about leading up to this day, that there will be moments and opportunities to help, yet we’ll walk by the poor on the street. We’ll demonize the ones who are oppressed. We’ll not ‘have the time’ to go and visit. We’ll fall. We’ll fail. We’ll be goats. Did you know that the disciples themselves were pretty big ‘goats’ too? As I said, this text comes just mere chapters away from Jesus on the cross. Where Jesus – as a colleague of mine put it – literally becomes the hungry, thirsty stranger and the naked, sick prisoner. Jesus foreshadows what is literally going to happen to him. And even on that cross, even in that moment where his friends and followers leave him out to dry – literally hanging from a tree – what does he say? Does he offer condemnation and spew fire and brimstone upon those who desert him? Does he throw those who fallen from his side into the outer darkness? Does he condemn anyone to eternal punishment? No, that’s what we would do in that situation. When someone abandons us – we turn inward and cold upon them. Yet, Jesus does something marvelous in my mind. He looks out upon all those who seek to do him harm, those who have turned on him, those who have run from the scene to save their own skin – and he offers up forgiveness. Father, forgive them for the don’t know what they are doing. After that he dies, and all seems lost, yet three days later he rises from the grave in resurrection. Vanquishing that which tried to destroy him and us. He wins the war. In that moment, the war over sin and death is won. God has staked claim in the light and life of the world. The victory is well at hand. Yet, we still remember those harsh words from Jesus – the harshness of the world that still continues. The harsh reality that there are still those who are hungry, thirsty, sick, cold, tired, imprisoned. In what God has done for the world, we get to live out that new life for others. Our Lord has forgiven us – from the cross. We cannot deny that. In the new and forgiven and gifted life of grace that we have received from our Lord, we are called to be with those in need. For though the war is won – which is indeed what we celebrate on this day of Christ the King – there is still a long road ahead. This is a text that can be very scary for us to hear. We’ll ask those hard ‘end of time’ questions because of this text. Did we help? Did we help enough? Are we good? What does God think? Yet, as I ask those questions, I think of the one who is sitting on the throne. I think of the one who is doing all this separating. I think of what that one – our Lord – has modeled for us through his ministry. I think of the one who has made promises to all of creation. Jesus is the one speaking. Everything rests at our Lord’s feet. We know who and whose he is, we know what kind of person – what kind of God – our Christ is. We look to the cross and God’s action in the world and we see the kind of king we celebrate and worship. The one who forgives, and loves, and grants mercy. For though I don’t believe that God needs our good works, our neighbors do. In this life that God has given and gifted to us, we get to be with and serve those in need. For in doing that – we continue to serve the one who sits on the throne. The one who even in our darkest moment forgives us from and through the cross. That is our king. That is the one who sits on the throne. That is the one in whom I trust. Amen. Grace and peace to you from God our Creator and our Lord Jesus who is the Christ; will y’all pray with me? May the words of my mouth and the meditations of all our hearts be acceptable in your sight O Lord, our Rock and our Redeemer. Amen. So, The Parable of Talents. At first glance, this text is a hard pill to swallow. No one likes to hear of weeping and gnashing of teeth. We hear a story that has to do with something regarding property or money, the talents the servants were given, and how each of them treats the lot that they were gifted. To better understand this parable, we may need to know what a talent actually is. According to my research, a talent is equivalent to 6,000 denarii. If we remember from some past lessons, we have learned that 1 denarii is equal to about a day’s wage for an average worker during this time in history. So, a talent equals 6,000 days’ wages. That is roughly TWENTY YEARS of days’ wages. One servant is given 5 talents, another 2, and the final servant is given 1. 100, 40, and 20 year’s wages. All at once. Wow. That is a lot of money. An average worker today in the United States, according to the latest census data makes roughly $45,000 a year. So, in today’s dollars each servant is given roughly 4.5 million, 1.8 million, and 900,000 dollars. That is A LOT of money. It is even more impressive that after some time the first two servants DOUBLED the funds they were given. We of course know the ‘plight’ of the third servant. Out of fear this one buried the gift from the master and waited for the master’s return. This is what the third servant suffered from. The third servant in our reading today suffered from fear, wanting to ‘play it safe.’ Fear of what he perceives to be a harsh and cruel master. So, instead of doing anything with the gift given to him; he buries it. He hides it. He hordes it. What I find shocking in this logic of the servant is that he has described in his mind a master who is harsh, yet we see a master who is more than generous, he fears a master who is cruel, yet we read of a master who has given his servants incredible leniency on what to do with the substantial gift they are all given. Something does not add up. The only thing I can conclude is that the servant was resistant to doing anything because he was paralyzed by the fear of not living up to the masters supposed standards; he was in fear of failure. If we look through Christ colored glasses, this text can begin to take on a clearer shape. The man on the journey is Jesus, the servants are followers in the faith who are blessed over abundantly with gifts from Jesus. All the gifts that we have received – the material gifts we possess, our own finances, our intellect, our physical abilities, our talents in areas of art and music, the ability to cultivate plants, and so much more. But, we also have been gifted an overabundance of life, love, service, grace, mercy, justice, forgiveness, and faith from God. We are also given the most incredible gift of all, we are gifted Christ. We have been given so much from God that we are called to invest our love, service, grace, mercy, justice, and forgiveness. We come to realize that when we do live our lives in the ways in which our God has called us, that we will take risks. God risked everything in Jesus; we too are called to take risks as well. Yet, taking risks can be scary. No one – not one person – can deny that. When we fear that risk we can become so bogged down in failing that we can become paralyzed and just bury those gifts given to us by God. Have you noticed that the end of that question seems to always be negative? 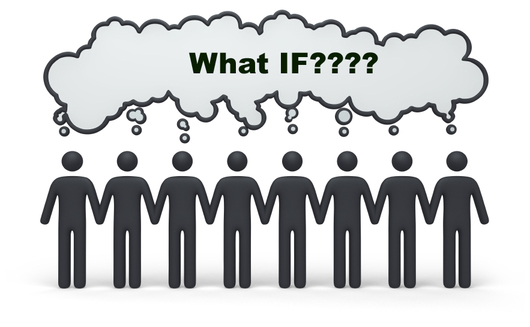 What if instead of listing negative things, our ‘what ifs’ focused on our faith and trust in God? We as disciples are in this time of waiting. The ‘master’ has gone off and we do not know when that one will return. Much like those bridesmaids we read about last Sunday, we wait. We wait for the second coming, we wait on Christ. Within that time, we are called to use our gifts that God has blessed us with – those gifts of life, love, forgiveness. We are blessed with the gift of Christ himself. We do not bury these gifts. We are called, encouraged, and commanded to use those gifts to enact God’s justice in the world. We use those gifts to show God’s work through our hands in the world. We use these gifts to show God’s Word put into action. As we do things, we will take risks. We could be subject to mocking. We could be rejected, could be yelled at. We could get hurt in a variety of ways. But, we also know that God is ever faithful. God will walk with us. God will be with us. God will continue to love us, to bless us, to hold onto us tightly because we are God’s own creation. We might see those whom a group of people stereotypes as ‘misguided,’ ‘foolish,’ ‘sinful,’ or any number of terrible descriptions. What if we loved them as we love ourselves? The risk would be great wouldn’t it? What if we shared the hurts and the pains that we live with? What if, we wore the scars of our lives uncovered and unashamed? What if, as we shared those hard truths – uncovered from the sterilized and ‘fake’ clean of social media posts – we proclaimed a God who is present with us in spite of those hurts? What if we proclaimed a God, who through such a great love, hunkers down into the trenches of life with us because of those pains? The risk would be great wouldn’t it? What if we as the church, as Christians, talked openly about our faith? What if we invited everyone we met to come and worship this loving God? What if we reached out and helped that family who is a little dirtier than we’d like? What if loved the sick despite their illness? What if we believed the stories of those hurt and walked with them through their healing? What if we stood firm against injustice and proclaimed God’s righteousness and love to all who could hear? The risk would be great wouldn’t it? When we walk that path that God has set before us, we open ourselves up to risks. We risk rejection, we risk fear, we risk being hurt. But, we also risk being loved, we risk showing and receiving grace, we risk being changed, we risk living into those gifts that God has graciously handed to each of us. I’ll be honest though, each night after we get back from wherever we are, I’ll go peak my head in their rooms just to check. And, you know what – they’re always asleep. Asleep in the middle of books, lights, and toys. I think of those moments as I read in this parable about those 10 bridesmaids. Because, if you hadn’t noticed before – whether they are ‘foolish’ or ‘wise’ they all fall asleep. All of them. I think that’s something that we always read past and don’t process. We just assume that the wise ones stayed awake, and the foolish ones nodded off. Yet, that isn’t the case at all. They all succumb to slumber and they all are roused from their sleep by the call that the bridegroom is finally here. Whenever we’ve read this text before, I think we’ve always interpreted it in such a way that we must be in ‘constant vigilance’ mode. Always at attention, always on the lookout, always wary about who’s going to walk in through the door. But, I’m not sure that the text is calling exactly for that kind of vigilance. In fact, I want to shift a little bit in what this text brings to our attention. This text – as I read it – isn’t so much about always being prepared (even though it does ask us to be prepared) but, that the bridegroom – our Christ – is going to come. Though, probably not within the timeframe that we’d expect. It’s gonna be awhile and that means you’re going to have to wait. I don’t know about y’all, but waiting stinks. This past week I waited every day for my car to arrive at my door. Even when I KNEW when it would get here, it was exciting, annoying, frustrating, and still brought up some anxiety. Would it get here on time, would it be what I expected, would I be happy with the delivery? We don’t like to wait. Especially when we know when something is supposed to arrive. In the world we live in today, we can track things like never before. We can know – almost to the second – when something is supposed to be ready. When things go off schedule? Woe be to the one who feels our wrath. My package was supposed to be here today! What happened! I literally watched on your app as my pizza was being made – why isn’t it ready? In our waiting, we become frustrated – especially in those petty and small moments like waiting for pizzas or packages. Yet, still… we wait for other things that are much bigger ordeals – moments where we don’t know when ‘it’ will come. Waiting for a child to be born, for a friend to arrive, for food to be served. All those can be exciting moments as we wait. We still don’t like it, but we wait. But, then there are those moments that we don’t look forward that we have to endure waiting – when is the surgery going to be done, how long are they going to deliberate on my job status, or even more anxiety inducing moments. We wait. And it stinks. Especially when we think it’s taking too long. I imagine many of you might be feeling that way as we see more reports given about violence somewhere in the world, especially after the news of last week with the shooting at a small church, in a small town in Texas. How long O Lord are you going to take to return? What more do we have to go through for you to bring heaven on earth to us? What’s with the delay? We’re falling asleep over here! Waiting. We still wait. We don’t know when the Lord will arrive. So, if we have to wait – what are we to do? There’s something else that I noticed in this text that I overlooked many, many other times. Wise or foolish, these 10 bridesmaids are together in their waiting. They are with one another as they wait for the groom to arrive. They are with one another as they each fall asleep in their waiting. They are a community together. Perhaps that is the best thing to pull from this text as gospel. Perhaps, in our knowledge that we will wait. That we are watchful. That we don’t wait in hope alone. We do this together as the body of Christ as the community of believers. I think about that as I go and visit and wait with folks as they are anticipating news of any kind. Good or bad, it helps that we wait together. It is never fun to wait alone, that brings so much more anxiety, intrusive thoughts, and more. Sitting with others as we wait for news about a surgery. Being present with family as they await the news of a new baby born. Even having fun with folks as we still wait for the pizza to arrive. We wait together. We wait together as we are watchful for when Christ will return. As we wait together we continue to serve those around us, reaching out to those who come from afar and in ways that are different than what we expect. We wait. Knowing full well that as we wait, we’re probably going to fall asleep together. Yet, our God is still going to come, no matter what. And that is good news. Amen. Grace and peace to you from God our Creator and our Lord Jesus who is the Christ – will y’all pray with me? May the words of my mouth and the meditations of all our hearts be acceptable in your sight O Lord, our rock and redeemer; amen! So, at first glance… today might seem like we are smashing two divergent parts of faith into one service. Technically, you’d be correct. But, there’s more going on here this morning than you might have noticed. As we began our worship service this morning, we did so honoring and remembering those who have died and whose funeral services were either held here at Redeemer or the church participated greatly in the service. Some of those names we called out you know very well, and some might be ones you have never heard. Regardless, we honor and remember those who have died. Coming up in our prayers, you’ll be given the opportunity to speak aloud the names of those people who have died in your life outside this community and we will toll the bell for them as well. All Saints Sunday allows us that space to remember those who are no longer with us. It can be a very sad day – I’ve talked with a few and I have overheard a few conversations pertaining just to that. This day can be difficult. It is hard for us to remember those who are no longer present with us without that sadness. On this day, I think of friends and family members who have died that helped shaped me into the person and pastor I am today. At times, it might seem odd that we as Lutherans – who don’t celebrate ‘saints’ the way that other sisters and brothers in the Christian faith do – would set aside this sort of day. The church sets aside All Saints Day to remember all the faithful who came before us. It is a chance for us to remember together, to grieve together for the recently departed, and to remember the lessons of their lives and faithfulness. It is a day that we remember that we didn’t get here on our own. We have been shaped and molded; guided and prodded; pushed and pulled in our faith by others. Everyone has a story about someone who helped them in their faith along the way; a grandparent, a parent, a friend, a pastor, a child, a stranger – each of us has been shaped in our faith by others. It is what makes us a community. It is through that shaping and helping from others that we become strong in our faith in the ways in which we are challenged. Challenged where our beliefs and thoughts might differ, but also challenged as we see others live into the life of faith in specific ways – as others have modeled for us. This day, we remember, we mourn, we celebrate, we look to the future, we recognize our own responsibilities in this life of faith for others. For together – as integral parts of the body of Christ – we remember that we are the gathered saints. Gathered with those who have come before us, gathered with those around us, and gathered with those yet to come. We are the gathered ones – along with all those gathered around the world - who come to worship in praise and thanksgiving of what God has done, is doing, and will do in the life of the world – in our lives. So, this day, we remember those who have shaped us along this odd and wonderous path of faith. In that remembrance, we also see our place in the lives of others – as saints, as a part of the gathered multitude. And it is in that space and knowledge that we turn to our other celebration today – for today Samuel James Holland is baptized. It is here where we recognize that God has called him as God’s own. It is this day that he is washed and welcomed into this community and family. It is on this day that we surround not only Sam, but also his parents – Anne and Andy – with our prayers and support. It is on this day that we together become examples and models of faith for him, just as those before us were examples and models of faith for each of us. It is also where we remember how we are continued examples of faith for one another. Striving and working together in this crazy little thing called the life of faith. That’s powerful stuff right there. Each of us as a part in one another’s life as it comes to our faith. We are invested in one another. Invested in living together this life of faith. On this day, we hear our Lord Jesus speak from the mountain about all those who are blessed. When we hear those blessings, it catches us off guard and then I think we interpret that blessing in ways that might not always be productive. In my talks with colleagues and other pastors this week (not to mention in my visits to those in need) we talked about blessings. When we read this text, it sometimes feels as if we receive and respond to these blessings passively. You that are hungry? You’re blessed, you’ll be fed. You that are mourning? You’re blessed, you’ll find comfort. Where we recognize that if we just wait around long enough, our blessing will just turn into whatever it is that we need. I think that’s kind of dangerous, and continues to turn our God into the Americanized religious vending machine genie. Where we just wait in hope that God will just magically wiggle a nose and nod a head and things will be made ‘perfect’ for us. Sam, I’m going to tell you now – the temptation will be great throughout your life to believe that God works like that. For today, you indeed are set a part. God’s blessing is laid upon you and your future in faith is wide open and full of wonderful possibilities. In those days, you and we will remember a few things. First and foremost. On the day of your baptism, as your parents brought you to this font out of love, faith and hope. You were washed. Not washed so that you could finally be clean in God’s eyes; to finally be clean enough for God to love you. No. Not at all. In these waters, you and we will remember that in our baptisms we are washed so that we might know what God already knows – that we are good. We are loved. We are welcomed. God has already declared us – declared you – good. In our baptism we get to know what God already knows. Sometimes it’ll be hard to remember that. But, remember it nonetheless. You. Are. Good. God has declared it so. Then, you’ll remember with us all those who came before. You’ll remember those saints in your life – those who are already present there and those who you have yet to encounter. You’ll be filled with faithful examples and models about hospitality, love, service, prayer, and more. You’ll remember that you too are a part of this wonderful, crazy, and eclectic mixture of people. You’ll hear stories of these models of faith, how they took particular pleasure in God’s beauty through art and song; wanting to share that beauty with others. You’ll hear stories of those saints who used humor and laughter to help spread God’s message of love. You’ll hear stories of how we take care of and nurture what God has given us so that we and others might be fed to live out this life of faith. You’ll hear stories of living out that radical hospitality, reaching out to and care for those whom others have cast aside. You’ll hear the stories of the saints who helped shape us in faith and in turn help shape you as well. You’ll remember that in these waters you are blessed. That on the day you were baptized we celebrated God’s presence. We celebrated the fullness and completeness of God’s presence. From the beginning of our life, to the washing and welcoming into the community, to the life and (at times) great ordeal that we live, in our death, and beyond; God is present with you. That is our blessing. In that blessing – in that faith and hope that God is already here – in that faith that you have been called and saved through what God has already done in Christ our Lord – we get to be active in that faith and blessing. We don’t just sit around. In the faith and knowledge that we are blessed, in the faith of what we have already received freely and graciously from God – we live into and actively participate in those promises that your parents and your community will make today. Those same promises that you too will sit with and join in on in the future. Today we remember All the Saints of our life. Today we celebrate the baptism of Samuel James Holland. Today, we remember that each of us is blessed by God. Today, we remember that in that blessing, God is indeed present with us. Knowing that God is indeed present with us, we get to participate and live out those blessings and this life of faith for others. Amen. Grace and peace to each of you this day! October was busy, and it doesn’t look like November will bring any sort of relief. It is always at this time that I look at my schedule and want to crawl right back into bed. This time of year can be overwhelming with expectations, activities, meetings, and surprises. At times it can seem to be too much. It got me thinking that we – as a people – are overworked, stretched thin, and pulled in so many different directions. Our world works in such a way that everything seems to be important and must be attended to at this very moment. Notifications pop up on our phones about a myriad of news, tweets, and game updates. Everything seems so important. We have to react, we have to have a response. I don’t know about y’all, but it is exhausting always being in a ‘heightened’ state of awareness. So, I’ve done a few things to help lessen that pull. Turn off notifications on your phone. Do it, it’s OK. Set a time later in the day to catch up on the news. It’s OK.
Once you do that, you’ll notice that you have a bit more free time (and perhaps a lot more energy) to devote to other things. I would like you to take that new-found time and to sit in silence. We are pulled in so many directions and are lives are so hectic that we never get to sit. To be calm. To perhaps even talk to God in prayer and thoughts. As you sit in that new stillness, I invite you into prayer, to think about the good things in your life and give thanks for them. Pray for those who are hurting. Ask God to open your heart and your life to those who are different from you. Dive into the Holy Spirit’s guidance for the day to see God at work. I know it might be scary to turn off those notifications. Especially the news and social media updates. But, I promise you – those things can wait. Take those freed moments to be in prayer. Read a little scripture. Give thanks to God. Know deep down that God has claimed you, you are fearfully and wonderfully made, you are good already in God’s eyes. Amen. On October 29th we gathered with over 300 other individuals at Wiles Chapel on the campus of Newberry College to commemorate the 500th Anniversary of the Reformation. 500 years since Martin Luther stood firm in his beliefs against the corruption in the church during his day. Unbeknownst to him, it would cause a ripple within the church that extends to today. I didn't preach that day. Instead my friend and colleague - Rev. Earl Schafer - preached for this service. You can watch the entirety of the service below. Enjoy! If there is one thing I learned from the Pharisees, religious elders, Herodians, and all those who were set to lay a trap against Jesus – it’s this: the quickest way to end a conversation you don’t want to be in is to talk about money. Of course, the ‘trap’ they hope to spring is ingenious and simple. Should we pay taxes? If he says yes, he’ll lose the support of the crowds that love him so much – and they’ll possibly respond violently to that – they are an oppressed people after all. If he says no, then the Roman powers-that-be will have reason to silence him by any means necessary. He can’t get out. Jesus, it’s a trap! Abort, abort, abort! But, as usual, our Lord takes it another direction and cuts to the heart of the issue – the one that those asking didn’t even know that was there. Each of us – you and I – have been created in God’s likeness. Every person we come across – every single one – has been created in God’s likeness. From the person you cannot stand to be apart from to the person who drives you mad with all his blunders. Each one, each person, has been created in God’s likeness. And there’s some things that come with that. First and foremost, we have been created. We are God’s very own. We have been fashioned from the earth and have had the breath of life fill our very selves. The same one who fashioned the intricacies of the galaxies is the very same one who knows the hairs upon our head. And I don’t believe God knows this stuff to ‘hold it over’ us (don’t cross me, I know who you are! ), but instead knows us to remind us every day – through all the ways – about who and whose we are – God’s. Fear not, I know who you are. We are created, and we are created in God’s image. That calls us to be stewards of what God has created and to be good towards those who have been created in the image of God. Now, this doesn’t mean we behave as if we are gods. We don’t go around demanding that people bow to us, serve us, and shower us with adulation, devotion, and loyalty. As followers, created beings, and bearers of God’s image we are not called to that in life and perhaps we should be wary of those who do seek and need that sort of attention. But, as that same theologian writes, we are to act like God – the one who creates, sustains, redeems, and saves. We are called to stand with God as partners in this life caring for all of creation – all of it – as if it were our own. In many ways, the ones who come to Jesus with their trap – especially the Pharisees in the group – have forgotten whose and who they are. Instead of being covered in God’s image – and remembering that they are indeed created in God’s likeness – they have cozied up to the powers that be. They’ve covered themselves in masks that hide their true created nature. They’ve been pulled away from the very good news of their life. They’ve been lured away from the promise and hope of what it means to be made in the image of God. I think this is something that we still suffer from today. We have forgotten in whose image we have been created. We have forgotten the goodness that we have already been declared to be. The goodness that is shown to us in our baptism where we remember again what God already thinks – we’re good. The goodness we are reminded each time we come to this table to receive this meal. We receive it because we are God’s and God has invited us to the table. We are sent out into the world to proclaim this truth. This truth that we don’t need to cover ourselves up with all these other icons and images. We don’t have to dress ourselves up so that we might look ‘good’ to others. We don’t have to seek the approval of others in order to define our self-worth. We already have that worth because we have been created in God’s own image. We remember that. We live that life. We live out that life as we are called to act like the God we see in Christ our Lord. The one who gathers, cares for, speaks with, and dives into the messiness and craziness of relationship with all he meets. And that’s where the difficulty lies. For if we are created in God’s image – because God has created us, we must remember that God has created the other before us as well. They too have been created in God’s own image. We are called to care for them – just as they are called to care for me, for us – because we are called to care for God’s creation as good stewards. That can be hard, really hard. But, we stay in these conversations and relationships. Guiding, showing, and encouraging others to see not only their worth in God’s eyes and mind, but sharing the equal worth of others in God’s eyes as well. We get to live into this life and act like God. To act like the God we see in Jesus Christ our Lord. To act like the ones who create, nurture, care for, walk with, hold on to, bring to health, listen to sorrows, rejoice in joy, sit in silence with, speak boldly towards, and probably most importantly to love – no matter what – the person before us in our lives. You are created in the image of God. We are created in God’s likeness. We – as creations of God – we these beings created in God’s likeness – we probably should start acting like it. It would so benefit ourselves. It would be so good for those around us. Amen. So, there’s a wedding. Invitations are sent out. Those crème-de-la-crème that are invited decide that they’re too good and they don’t even attempt to come. The feast is spread. The party is here. Come on over! Let’s celebrate good times! The answer from those invited is a resounding and disheartening no. I’ve been fortunate enough to be involved in a lot of weddings. It is a ‘perk’ of being a pastor to be involved in such gatherings and celebrations. I know how much stress goes into planning a wedding. I cannot imagine the amount of stress, anger, and sadness that would transpire if no one that was invited showed up. And remember – this isn’t people who ‘forgot’ about the wedding. These aren’t even people who are too busy to attend. These are people who simply don’t want to come. They refused the invitation. Can you imagine that hurt, that sadness? Can we understand that anger at being made so small and dismissed? You’ve invited people to celebrate in this joy. You want to share this joy with those you love and know. Yet, no one – not one person – feels it’s important enough to attend. We hear that part of the parable, we recognize that sadness and anger, and then we see the king in this parable do a surprising thing. He sends out his servants to gather anyone and everyone to come to the party. He invites – specifically – the good AND the bad. Invites them to the party. Fill this place up with people. Throughout this parable – I love that image. We see fanny packs and sandals. We see tattoos and track marks. We see sashes and trash bags. We see tube tops and trucker hats. We see it all. Mostly filled with the people we wouldn’t expect at that wedding. I don’t know about y’all, but that’s kind of a cool sight. Seeing those whom you never expected to be feasting on the best food, drinking the best wine, and having the grandest of times. Those who never thought they’d be invited, and not only are they sought out to attend, they are lavished as honored guests; they’re the ones on the dance floor. That’s a cool image. The kingdom of God is full of those whom you wouldn’t expect, couldn’t expect. God has sought them out, brought them in, provided them with the best feast of food, drink, and fun. Everything so far is OK in our understanding of this parable. We are right there walking along with Jesus as we are enjoying this little parable. We have lots of good and warm fuzzy feelings. Yet, then we are introduced to that guy. That guy who is not dressed the part, that guy who doesn’t have the right attire. That guy – is thrown out. Where did that come from? It doesn’t make sense. How can someone be thrown out when everyone is invited? I remember once after college when I was in one of my first weddings. Everyone looked so nice and dressed so well. It was definitely one of the fanciest weddings I’d been a part of. I was honored to be in the wedding party. And yet, I remember that there was this other guy – he was part of the wedding party too – I distinctly remember him because he was dressed in jeans. Now, I don’t have a problem with jeans – I really don’t. But, in that situation it just didn’t seem right. Especially for the couple. They were mad. Really mad about it. Because it was apparently done with intention; to draw focus; to be a topic of conversation. I even vaguely remember hearing one of them say, “I even offered him some pants – and he refused.” They were livid. He wasn’t thrown out where there was weeping and gnashing of teeth, but from the looks of my friends’ eyes – they really wanted to put him out there. The biggest source of anger wasn’t so much that he didn’t wear the ‘right’ clothes, but made the couple feel that he didn’t consider their occasion ‘worthy enough’ to be set a part. To be different enough to fully celebrate with everyone. Where he even refused their gift. I struggle – deeply – with this part of the parable in our Gospel today. It hurts. Anyone and everyone is invited – the good and the bad. People are invited from the (potentially) wildest of places to be here. And yet, this guy doesn’t belong? Again, I struggle with this text. Yet, as I thought, as I read, as I talked with friends, colleagues, and others I began to see – maybe – where Jesus is coming from. Perhaps where Jesus is pointing towards. Yes, anyone and everyone is invited. Both those who just didn’t make that initial cut and those who weren’t even a thought on the list. All are invited at seemingly the last minute. Did they really have the right attire – the wedding robe – on hand? I presume that they didn’t. When this parable begins the feast is ready and on the table. I think it is reasonable to assume that all these new guests didn’t have a wedding robe in waiting. But, the king’s got that stuff. I like to think that the robes were provided to all who attended. I think that’s reasonable, too. When you invite someone to partake in something at the last minute, don’t you usually help them out with what to wear, how to dress, what they need? Hey, my plans with some others fell through to go camping this weekend – you wanna come? I know this is last minute, but don’t worry, I have everything you’ll need. Everything. I promise. Hey, I know this is last minute, but do you want to come to this shindig I’m hosting? It’s kind of fancy and to help you out I’ve got some stuff for you to where. You’re doing me a favor by being here – and I want you here – so I’m going to help you out. Don’t worry. You’ll fit right in. We do that sort of stuff, don’t we? I like to think that the king was aware of that as well. He invited people at the last minute – literally the feast is prepared, and he doesn’t want it to go to waste. So, he invites all the people to come and to show them even further honor in attending; to help them see that they definitely belong there, to make it further known to them how he sees them as honored guests, he decks them out with a wedding robe. I think that fits in our lives of faith as well. In this kingdom of God that is here and now – we are invited. We weren’t the first on the list, if there was a list that some were on, it might’ve been the ‘do not invite’ list. Yet, in this celebration we are called, invited, and gathered here. We are welcomed to this great table, and what do we put on? We put on God’s grace. We cover ourselves in Christ. We have been given robes of faith in our baptism. Where God has invited us in and washed us clean – not so that we look presentable – I don’t think of it that way at all. Instead, I see baptism as God letting us see ourselves as God has always seen us; clean, pure, perfect. God’s own. We have been washed so that we might know how God already views us. We’ve put on that robe, we have been clothed in our faith in Christ. This gift that was given to us freely, we put it on and gather at the table. Imagine the pain and hurt of the host when an invited person comes in (remember, they were all invited good and bad) and then refuses the gift at the door? We have been given and lavished with wonderful gifts of life. We are invited into the kingdom through grace. We are washed so that we might know how worthy and good God views us. We are welcomed to the table to feast on the bread of life, the cup of salvation – the body and blood of our Lord. Filled to bursting because of God’s love, mercy, forgiveness, and grace. We are sent out to invite others to be a part of this immense and glorious feast. As Paul writes in Philippians – rejoice because you are here. Rejoice now and forever because you have been – we all have been – all of the world has been – invited to be here. Wash and know how God sees you as good and worthy. Come to this feast because you have been welcomed here. Be filled and go out in that thankfulness to the world. Serve. Love. Be generous. Rejoice. You’re here in God’s grace. Your covered in God’s love. Your faith has made you well. God’s given that to you – always. Forever. Free. Rejoice. Share it with everyone else, because you know what? God’s invited them too. Amen.